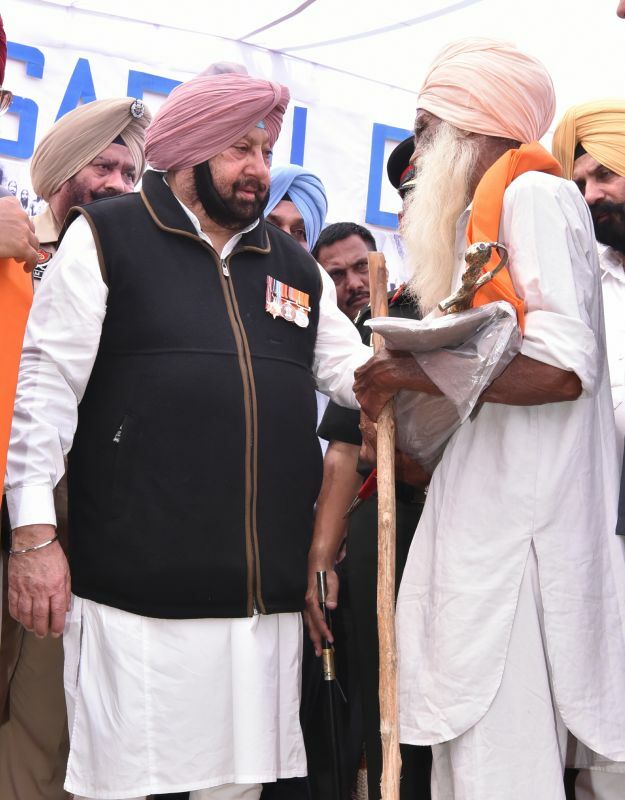 Ferozepur : Punjab Chief Minister Captain Amarinder Singh on Wednesday paid rich tributes to the soldiers of the historic Saragarhi battle on its 121st anniversary, and assured that the state-of-the-art Saragarhi Memorial would be constructed before the next anniversary of the event. After paying obeisance in Gurdwara Saragarhi during the state-level martyrdom day function, the Chief Minister went to Barki Square to pay floral tributes to the great martyrs who laid down their lives in the Indo-Pak war. 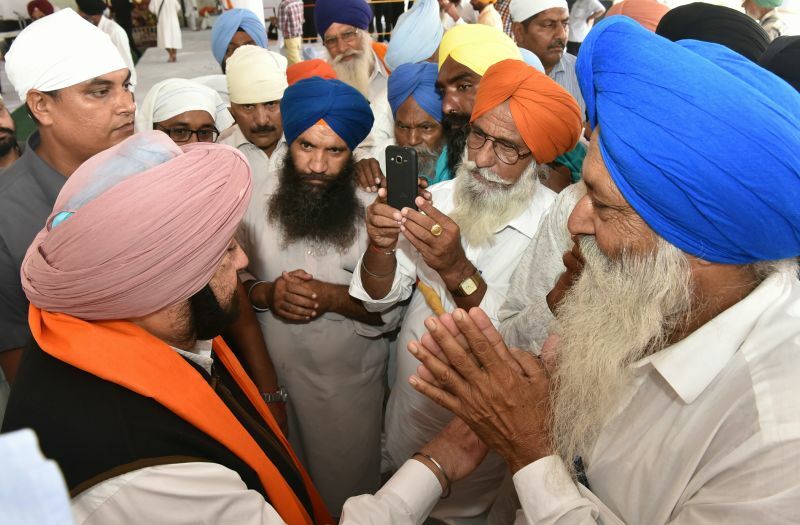 While addressing the gathering at the Saragarhi Gurdwara Complex, the Chief Minister recalled the exemplary valour of the 22 soldiers of the 36 Sikhs stationed near Samana ridge (now in Pakistan), who laid down their lives after a fierce battle following an attack by nearly 10,000 Afghans on September 12, 1897.The Chief Minister said that soldiers of the Sikh regiment, led by Havildar Ishar Singh along with Naik Lal Singh, Lance Naik Chanda Singh, showed exemplary courage and heroism by fighting against 10000 Afghans to their last breath. The model depicting the architectural and layout work for the state-of-the-art memorial had already been finalised, said Captain Amarinder Singh, adding that the Saragarhi Memorial Management Committee under its Chairman Maj Gen J S Sandhu, GOC, 7 Inf Div would oversee the entire construction work of the Memorial. He assured the management committee that his government would extend full support in the execution of the iconic project as a befitting tribute to the Saragarhi martyrs. Responding to the demand raised by local MLA Parminder Singh Pinky for establishing Saragarhi Memorial Institute for Competitive Exams in Ferozepur, the Chief Minister said that the state government would take necessary steps after getting the matter thoroughly examined. He also assured fulfilment of the other demand for setting up Saragarhi Club here. Captain Amarinder Singh announced that the state government, as a part of its anti-drugs campaign, would examine the demand to establish a modern Rehabilitation Center. The Chief Minister also assured all support and cooperation on behalf of the state government for the School of Special Children being run by the Army in Ferozepur Cantonment. In his welcome address, GOC JS Sandhu thanked Captain Amarinder Singh for taking personal initiative for the development of the Saragarhi Memorial as an iconic project, which would go a long way in inspiring the spirit of patriotism and nationalism among the youth.Earlier, the Chief Minister paid obeisance in Saragarhi Gurdwara, where a siropa (robe of honour) was given to him. The Chief Minister also honoured 11 family members of the Saragarhi martyrs with a saropa and lohi. They included Santokh Singh, the kin of Havildar Ishar Singh; Balraj Singh, Kabal Singh and Sarabjit Singh, the kins of Naik Lal Singh; Harbans Singh, kin of Lance Naik Chanda Singh; Gurnek Singh, kin of Sepoy Utam Singh; Mahinder Singh, kin of Sepoy Narain Singh; Joginder Singh, kin of Bhagwan Singh; Balwinder Singh, Raghubir Singh and Jaspal Singh, kins of Sepoy Sahib Singh. 08 Sikh, 10 Sikh, 4 JAK RIF (28 RR), 51 Field Regiment (Artillery), 113 Engineers Regiment, 13 Sikh LI, 2 Sikh, 21 Sikh, 92 Field Regiment (Artillery), 19 Punjab and 332 Medium Regiment.Among those present on the occasion were Sports Minister Rana Gurmit Singh Sodhi, MLAs Parminder Singh Pinky and Kulbir Singh Zira and GOC J. S. Sandhu.